The War Room | Gentleman, you can't fight in here! There are five resources in GC (Ore, Water, Gas, Bio, and Crystal) that are used to upgrade your colonies. Each planet will have varied resource strengths and weaknesses. My hope is this will drive significant trade in the early game as you work your specialization and trade to get the rest. I’ve got two possible systems in mind that bring some additional strengths to the table. In both cases a citizen can still only extract one resource per turn for a $ cost. In this model, planets have a limited number of resources available. Extraction costs for available resources would be a single number, while there would be a high priced option to extract an unavailable resource (4-5 times cost, I want focus to be on trade). For example, Colony A could begin with 20 Ore and 8 Water. Extracting those resources would cost $25 each, and take a citizen one turn to extract. Crystal could be purchased with a citizen by extracting for $125, but it would be much smarter to trade if possible. As your colony grows, you can upgrade Education which would grant additional available resources per level. This would represent the technology and skilled workers involved in gaining even more access to resources. So, once gaining Education 1, Colony A would gain an additional 25 Ore, 10 Water, and 3 Crystal. Planets would still retain a focus, and maybe some random chance of additional resources. The benefit of Education here would be allowing you to build out an existing colony. Your other option would be to move your citizens offworld and extract resources on newly found planets. Forgoing Education and spending on Military might allow you to more comfortably control a larger region of space for your migratory workers. My original thought was having diminishing returns on additional same-turn resource extraction at a single planet. Each resource would have a per planet extraction cost and again planets would be good at 1-2 resources and not great at others. Additional extractions of the same resource would then increase in cost as it becomes more difficult to do. So, if Crystal cost 25 in Colony B, the second extraction in the same turn would cost 30, then 36, then 43…etc. Next turn it’d reset to 25. Differences between planets would be the differing costs per resource. In this model, Education would grant additional “cheap” extractions per education level. So a Level 2 Education colony would allow three extractions at 25 before starting down the curve. It would encourage more consistent extractions rather than waiting and then extracting everything you needed the same turn. The downside for this one I think is that in the early game it hurts trade. If you’re extracting 3-4 resources in turn 1 it’s likely you’re going to start paying so much that instead of trading your specialty you just buy it outright. Both of them solve a problem we saw in the GC run we did that several players commented about – once you found 5 colonies that were good in each of the same resources, you had little incentive to expand out further. It opened you up to attack and spread yourself thin with little benefit. Picking up a second Ore colony or even a third wasn’t something that happened too often. I tried to offset this by making the ring map have cheaper planets in the center that were higher risk, but even I didn’t feel there was a strong enough expand vs. build up decision. I’m leaning toward the first one, but am open to ideas. I like the first one because it adds a time decision to your planet colonization strategy. Not just if this is a good one or not, but how is it going to look in 5 turns, 10 turns, and should I plant my flag to be ready for this. I also don’t think it makes Education an auto-pick at any point. I think aiming for enough resources for ~4-5 upgrades and 3-4 turns gives you a chance to explore nearby systems before making the decision to upgrade Education. If you choose to expand into nearby systems quickly, you don’t need to go that route right away. The second one I really worry about it zapping trade. I also think once you get 2-3 education in you don’t really get posed with a decision again unless you get a population boom. You can keep extracting away and not worry about that static colony. I like the idea of it going dry and even in late game trying to decide to spend the money for Education 4 or 5 or spending the time to move your citizens off. Eager to hear your thoughts. When coming back to GC design after a bit of a break and reviewing the notes, one thing immediately struck me as a big problem: Education. I don’t really like the Specialist Citizens solution that doesn’t add much of a fun choice and definitely clogs up the UI. Back to the drawing board I decided to consider replacing the upgrade choices and came up with Logistics instead of Education. Each point of logistics would add to empire wide Actions available for use. These would not be cumulative round-to-round. The primary use of logistics actions would be Ship Movement and Population Movement. If you want to move around many of your ships, you’ll use up your actions. There likely would be some base action number for early empires to use (3?) so population movement and explorations can be done without too much investment. Now, the concern would be putting too much into Logistics such that it becomes another auto-purchase Economy. Because they aren’t cumulative I think there’s less a risk of running away and some of those trade options could potentially have other requirements. I think I’ll drop the name Economy rather than Education and swap their abilities. I think this brings us to a nice spot where Military affects fleet supply, Medicine affects pop growth, Logistics affects actions, Engineering affects ship classes/defense, and Education affects resource extraction rates. I think all sound like viable paths and none quite jump out to me as an auto-pick strategy. I think there were three problems with scouts in the first game: a separate supply from ships, too cheap of a cost, and visibility into the system even if the scout was destroyed. As a result players built a lot of scouts and had fairly consistent intel across the map most of the game. Cardona had 8 scouts, Eldrazi 7, and Quetzelquidian 6 across the map on the final turn and combined with their ships and colonies a large percentage of the map was exposed for little cost. -More expensive scouts – push the decision to make a scout or not a little bit more. They’ll still remain cheaper than ships, but not quite as cheap as $5 – maybe $10? -Share supply with ships – Ship supply will be increased compared to the previous games but you’ll have to share the supply with your other ships. 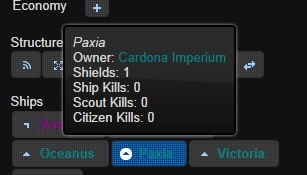 -Destroyed ships no longer grant info – if your ship gets destroyed, you don’t “see” into that colony. You definitely have a good chance to spy on your enemies and allies with this but do have a chance of getting detected or destroyed. Obviously the odds could be tweaked as needed to grant a sweet spot between the two. Because the ship can’t attack having a whole fleet of these would put you at risk, but it could potentially setup a supportive role for empires in a war they otherwise may not be involved in. I’ve got a neat idea for a replacement disasters system, but I fear the development time may be too lengthy to make it in to this next one. I’m considering holding off on the disaster bit for this version, but I did want to take an early game system I had an idea for and pitch it. Exploration. I had a few goals in mind when I started thinking of a new system to add. First, I wanted to add some texture to the map. There will be more planets due to the increased player count and also because I wanted people to get larger empires. Removing penalties for expansion and increasing citizen growth I think will encourage filling out the map, but I did want to make it more than a wall of planets connected to each other. This game I anticipate ~4 or so jumps to the nearest player that will slow some of the player interaction down to give people a chance to play some turns without a huge risk of annihilation. Second, I wanted some system that might provide emerging decisions for players in the early game beyond building your empire as expected for several turns while in safety. Something to do with your ships, and also another random aspect to look forward to that may alter your plans. Third, I wanted there to be a decision about how you explore the map which will become more apparent what I mean as I explain it. Moving a ship into a new system will still grant you information about enemy ships there and the resource profile of the planet (good at water, bad at ore, etc.) but your ships will now have an Explore Action they can take. Exploring a planet takes a turn which represents your ship sending out probes, away teams, reversing the polarity on the navigational deflector to gain insight, whatever. Doing this will give you a deeper reveal of the system. Systems can have either nothing of interest, a one time small benefit of a resource or money, or native alien species. Any aliens present will then provide you with what is essentially a quest. The aliens are seeking someone who will be able to get one of their colonies (any one) up to a certain technology level, for instance they may require Engineering 2 for you to collect the reward. Once a player with this condition met visits the colony, they can collect the one time reward which could be citizens, or a larger amount of resources or money. While the reward is uncollected, no player may colonize the system. Really want that system but don’t have the time and patience to unlock the reward? Sending a somewhat large early game fleet (4 ships?) in can destroy the aliens and unlock the planet for colonization that way. Unfortunately you’ll lose out on the reward (or prevent an enemy from getting it) and your actions will be announced in the Galactic Times. However, it can be an effective means to an end. So, you have two effective early game exploration options. Do you send your ships to the far reaches of the galaxy with the goal of removing the fog of war, learning about enemy positions, and finding out colony resource profiles before they get colonized? Or do you slowly explore spending several turns of actions in nearby systems with the hope of getting small bonuses or finding alien species that give you a direction for your own colony upgrades. I imagine by mid game most of these systems will be explored and many alien species will be assimilated or destroyed as things start to heat up and player conflict escalates. If I include it, I do hope it will make for a fun early game. What do you think of this new system, is it something I should include? Would you be okay with removing disasters in this iteration with it likely returning with a cooler, more fully developed system in a later one? So this would appear on a mouseover on PC or if you clicked a ship you didn’t own on mobile. If you clicked a ship you did own the normal dialog that would let you move them etc. would display the same information at the top. So you see, the first citizen is a Hydrologist (on mouse over) and also the blue color at the bottom. Since it is yours it does not have a country identifier. This is an extreme example because almost all of the citizens are specialists here, with the last two citizens having already extracted Ore despite being specialists in gas and bio. If you weren’t the owner, the mouseover or click would display the owner’s full information and the button itself would display the owner’s two letter code. What do you think about how I am considering displaying this information? Military – Mostly the same, source of unit supply and provides orbital platforms. As outlined previously those will be destroyable and rebuildable. Military provides both the free orbital and the maximum if they need to be rebuild. Medicine – Mostly the same in concept. Colonies will no longer get a free 10% chance of generating citizens, but for each turn you do not generate a citizen you will earn a +5% chance of doing so. For testing, I’ll start with a base of 8% per Medicine and 5% per turn without growth in that colony. Engineering – Yes will still grant shields. Probably will not be a ship building limiting factor. Probably will be the way you determine what advanced classes of ships you can build in that colony. Education – New System – Specialist Citizens. Education grants an 5% chance per turn of changing one of your citizens into a Specialist. Specialists are good at one specific thing such as a Biologist who is good at extracting Bio. The Biologist citizen can be used as any other citizen activity you want, but when extracting Bio you get 2 Bio for the price of one. Economy – No longer associated with money generation. Resources will now have an increased cost to extract the same-resource on the same-turn in the same-colony. For example, if it is 20 to extract a Bio on Rhodes, the second extraction may cost 24 and the second 29 and the third 35, etc. Economy will allow you to extract 1 additional resource at the starting cost… so 1 economy allows you to extract your first at 20, your second at 20, and your third at 24… etc. What should dictate how many ships you can build on a planet? Instead of Engineering dictating how many ships, I was thinking you should use a citizen to build a ship. This creates an additional choice and fits the general theme of using citizens to do various actions and means if you want your front lines to supply endless ships, you needs citizens to support that. What should limit the number of citizens who can work on a planet? Previously was Education, it could stay there but with the specialist mechanic I am wondering if that is doubling up on that one too much. Economy might make more sense in the long run. Or even Engineering as having the infrastructure for the massive population to be productive and working. Don’t focus too much on the fiddly numbers in your comments. 5%, 8% whatever we can really square away with some help from our resident statistian and playtests once we narrow down what everything actually does. I’m more interested in general trying to make all five interesting, unique, and force some really difficult decisions on players. Map Changes – First, I will have a map that should allow allies (and enemies?) to be closer, the ring map gave you essentially 2 neighbors and if one of them turned on you with some help it was a challenge to get through. Combined with diplomacy and faction changes mentioned earlier, I think people may think twice about attacking. Planet Hopping – New to the game, if you are in an enemy territory and move to another enemy territory there will be a penalty. It will be some kind of “free shot” from ships that remained in the territory that will allow you to risk getting hit twice in one game turn. The free shot may not be at full strength, however orbital platforms will likely be particularly good at this. Retreating to neutral or friendly territory will not generate a free shot. This should allow a fleet to overtake a border colony but they will take more losses to do so and will have to seriously consider the consequences of being deep in enemy territory. Structures (Shields, Orbital Platforms, etc) You will be able to destroy structures and rebuild them. So having 3 shields may help you initially, but eventually they will may get destroyed. I don’t think I’ll continue to allow upgrades to be destroyed (the 50% chance of destroying an upgrade if you killed a citizen) it was fiddly and didn’t work the way I hoped, but I think chipping away at structures will be worthwhile. Repairing them wont cost money, but resources (likely only 2 to make them cheaper than technologies so like 1 gas 1 ore to rebuild a destroyed platform). Economic Impacts – In a future post I’ll discuss upgrades and economy ideas, but let’s suffice to say that war of any kind in a colony will affect the economic income of nearby colonies. This should be tool to both hurt enemies and one to find allies from neighbors who have skin in the game due to conflict. Constant war at Martin would have affected QQ, TL, AND KT in the nearby colonies as an example. Shields – Oh, before I get here I wanted to mention I do want to allow everyone to name ships immediately. Of course GM veto on out of theme or stupid names. But, I think instead of 1 hit, 1 kill… 1 shield would allow ships to survive longer. This will be balanced against cost and ships without shields would be able to spend a turn for a repair action, perhaps costing some money to regain their shield. The idea is your named ships could fight again, and it might give some incentive to do incursions and retreats, repair, regroup, attack again. You will not be able to focus fire and will hit shielded ships (if available) before hitting unshielded ships. Instead of having different costs, these will unlock based on the level of Engineering (or Education or Military… we’ll get to upgrade changes later…) in the colony that builds the ship. Essentially, we’d all determine which is the best and worst and rank them in that order… above is a suggested order with Battleship purposefully placed low to encourage an early defensive game. So, I think these two combined reach a goal of making combat interesting but not too complex. You have choices of ship classes, but they wont always come up and the bulk of ship combat will still be the rolls and destruction of ships. Shields on ships will allow them to last longer and allow you to recover from a potentially damaging attack. And finally, I think with the above changes there will be some interesting choices of how you manage your fleets rather than get all the allies to clump together and hit one planet at a time until you eliminate a player. I appreciate the continued feedback… next post I will get into some details about how upgrades might work as I try to zero in on some code-dependent changes to the new system. About half of the players responded with comments about the latest system and they were all positive. This next post should generate some more discussion and controversy among players as I look at some possible tweaks to the game. The survey results indicated majority of players were interested in either some kind of shared victory conditions and/or some kind of faction system similar to WW2 Conquest. As an aside, for empire choices in this next version I was considering having each player pick an ancient earth culture as a basis. Greek, Aztec, Roman, Japanese, Egyptian, etc. as source cultures might add some flavor but still give you the flexibility to act as you’d like and embrace the culture as much as you’d like. While there is not a shared victory system, the individual victory conditions to establish dominance in the galaxy will become more difficult if other empires with your affinity are eliminated. So as an example, if the base victory condition is 5 upgrades at level 6, perhaps each eliminated empire with the same affinity adds one additional level 6 upgrade required. Affinities then will function to add some possible flavor to your empire (Cyborg Roman Centurions, Wolf Men Vikings, or Psionic Chinese Monks?) and encourage you to be concerned with wars across the galaxy. They would not, however, force you into alliances or prevent you from working with other players as you see fit. It should provide a natural starting point for those alliances, especially with new or unfamiliar players, but is more flexible than would be in previous games. If we want a more specific shared victory system, we could set it up such that two empires could spend several turns and publicly create a pact between them allowing for shared victory conditions. Doing so would be public, have a multiple turn timeline for establishing the relationship, and conditions such as alliance timeframes or money costs to forge a strong enough relationship between the two empires. Doing so might take otherwise strenuous victory conditions to a more achievable level. One comment from Paul, the winner of GC, was that upon achieving victory there really wasn’t much further discussion. In previous games, the alliances on top and those on bottom had more communication sharing stories and reveling in victory or speculating at what could have been in defeat. Allowing more closely tied relationships might provide a little bit more fun for players who enjoy working with others. A shared victory game might require some additional attention on winning conditions and seeing what could be done to keep the individual empire game decisions important. I do worry that funneling massive resources to allies could create less diversity of choices and a flatter game. What do you think – do either of these options sound good? What concerns do you have with either faction or shared victory conditions? What questions do you have about how they might work? It was obvious the diplomacy options needed some work and a player supported Galactic Council resolution passed to give players some additional options in the first game. Even with the update, it did not accurately reflect how empires were working together and in practice was used to manage movement but not indicate greater alliances. It was a one-way stance that led to some awkward interplay on the diplomacy screen where someone could be at war with a player who views them as an ally and it was easy to switch from ally to war in a single turn. Moving 1 step along the track in a single turn will be free and both players must agree to move up (e.g. from Neutral to Friendly). Moving 1 step down the track will be free, but will only require one player’s decision to do so (e.g. moving from Neutral to Guarded). Moving 2 steps along the scale in either direction will be possible but will have a moderate cost in money to do so. You may never move more than 2 steps in a single turn, so the worst case you can expect from someone you are Allied with is 2 turns to go from ally to war (with a cost). In GC2 your per turn money generation will no longer be based on Economy (see future post about upgrade changes and money changes) but upon citizens generating money in a colony combined with citizens generating money in adjacent colonies. The amount generated by the adjacent colonies will be a function of your diplomacy stance – allied generating the most money, neutral a middle amount, and war none. It will be up to players to then determine their individual contracts and consequences with other players and act accordingly using the diplomacy system and their fleets. How do you feel about these new diplomacy rules? 1) Rebuilt interface – no major changes as far as how the interface should look or function, but on the back end I have already rebuilt a lot to reduce web service calls for a faster experience especially on mobile. 2) Balance changes – Obviously the Education upgrade didn’t have as much utility. Econ had too much benefit to ignore. I hope to balance the upgrades to ensure they are all tempting options. 3) Diplomacy – I plan on having a clearer diplomacy system that includes possible economic benefits in addition to war. We should have a clearer picture of who is working with whom and some rules to give players pause when betraying an ally. 4) Some other tweaks that I still need to think through… Factions? Shared Victories? I’m hoping to do a 18-24 player game starting in the next two months. I appreciate the feedback I’ve already been given and would appreciate more feedback and discussion as I post specific rule changes here for discussion.